WhatsApp started out as an instant messaging application. However, for most of us, WhatsApp is no longer just an instant messaging application. It is so intertwined in our daily routine that it is almost a way of life. One way in which WhatsApp has truly revolutionized lives is how it has made group interactions so easily accessible. Whether it is your backbencher’s group from a school or the favorite cousins you only get to meet at family weddings, you can have a group for everyone. You can also create a WhatsApp group to plan a holiday, a party or even just a meal. Which brings us to the unavoidable topic of WhatsApp group names. How many times have you mulled over a WhatsApp group name trying to come up with the best one? Thinking of creative and funny group names is easier said than done. Everyone wants a funny group name that will stick around in everyone’s minds. There is also a need for unique WhatsApp group names that characterize your group. To help you out, here are some tips on how you can come up with the best WhatsApp group name. You can also see a unique group names list for your family, friends, students, cousins, ladies group and even one for doctors. Keep It Simple: It is always best to group names that are a few simple words at the most. These are more likely to be remembered by everyone in the group. Not to mention, WhatsApp has a limit of 25 characters for group names. Go For Something Funny: Everyone appreciates a bit of humor. You could name the WhatsApp group after an inside joke peculiar to the group or pulling someone’s leg in the group. Draw Inspiration From Pop Culture: There are all kinds of funny and unique names that you can find in pop culture. This includes names of movies, TV shows, books and songs. Add a filmy twist to your group names with the latest movie reference or use song lyrics for some memorable names. Mix And Match Words: Combine different names and words to come up with something unique, Use puns, metaphors, idioms, sayings, proverbs, etc. This could be related to the members of the group or the purpose for which the group was created. Still can’t decide on the perfect WhatsApp group name? Here are some ideas sorted into different categories to help you out. Also read, How Does WhatsApp Make Money? Love them, hate them or ignore them, there is no escaping being part of a WhatsApp family group. Every family needs a unique family group name. Here is a list of unique and funny WhatsApp group name for your family. WhatsApp is the perfect medium to discuss plans to get together with your cousins or even to catch up after a long time of not meeting each other. This list of WhatsApp group names for cousins will help you out. Weekend Boosters What’s Up Cuz? Whether it is discussing the latest movies, shows, restaurants or discussing your annoying new neighbor with your girl gang, WhatsApp is the perfect platform. Here are some group names you can use for the awesome ladies group in your life. Everyone has that random WhatsApp group that they have been added to. This list will help you decide on the best WhatsApp group name for any group of both boys and girls. WhatsApp is the distraction from everyday life that we all need. What better way to make our conversations even more interesting than by coming up with a funny WhatsApp group name. Here is a list of some of the best ones. You don’t have to worry about finding the perfect WhatsApp group name anymore. This is a list of some cool group names that you can use for any group. Also read, Professional Video Editing: What does it take? It goes without saying that you will have different groups on WhatsApp for different groups of friends. This is a comprehensive list of group name ideas for your friends’ groups on WhatsApp. If you are a doctor, it is highly likely that you will have a group with the doctors in your hospital or clinic. Read on to know some great names for your group of doctors. For all the single ladies and gents out there, there are groups that you can join to meet other single people. Some recommendations for group names for dating groups are given below. Who doesn’t like to start their day with a little bit of motivation? If you need ideas for motivational WhatsApp group names, here are some that you can use. Every Whatsapp group of sisters needs an amusing and memorable group name. Here are some names which you can use for the next time you have that gossip session with your sisters. Almost everyone has that one group of chuddy buddies they are still in contact with. Here is a list of names you can pick dedicated to that faithful group. Planning a walking or trekking expedition with a group of friends? Not sure what to name the Whatsapp group? Take your pick from these cool group names. If your quiz team is participating in a competition, it is necessary that they have the quirkiest group name to stand out from the competition. You can gain some insight as to what you should name your Whatsapp quiz group with this list. Sports and games are a common interest for people from all walks of life. If you are looking for the perfect name to give your group of sports enthusiasts, you can choose from this list of funny, cool ones. Finally, this is a list of general WhatsApp group names that can be suitable for any group, big small, formal or informal. Choose one of these names for your group and make every conversation interesting. 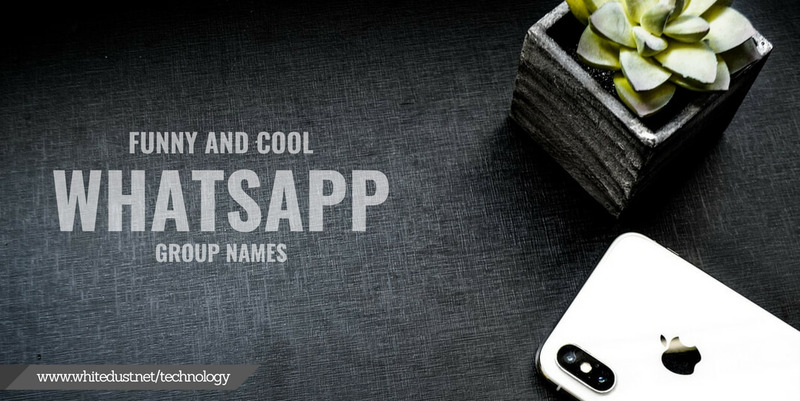 You can use one among the many WhatsApp names that have been listed above depending on the purpose of your group. You can even come up with a unique WhatsApp group name especially for your group if you put a little bit of thought into it. Make the most of Whatsapp groups with funny and cool group names.